These Ballot Boxes Are Multifaceted Plastic Donation Containers! These Raffle Bins Can Be Attached to the Wall! These Ballot Boxes Are Ready for Shipment! 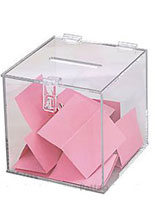 These inexpensive ballot boxes provide simple means of collecting ballots for elections or raffle tickets for a contest. 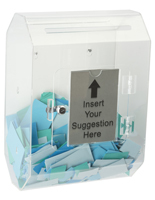 This frosted plastic donation containers are also suitable for gathering employee or customer suggestions. 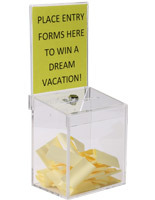 These ballot boxes can be used as countertop or wall mounted units. 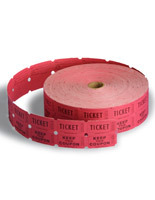 The raffle bins also make for great comment or fundraising donation containers. These ballot boxes measure 11"h x 4.5"d x 8.5"w, the graphic area measures 8.5"w x 5.5"h. The slot on the donation containers measures 5" long x 1/2" wide. These ballot boxes can be easily attached to the wall with two screws (not included). There are two keyholes in the back of the donation containers to hang the units from. 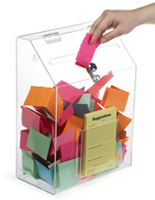 These ballot boxes, raffle bins are made of frosted plastic which obscures the view of the contents within. 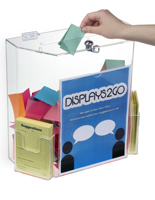 Post the donation containers in an employee lounge to gather ideas to improve company morale or to encourage participation in suggesting ideas on how to reduce spending costs. The compact size of the ballot boxes takes up little space on a counter or wall. 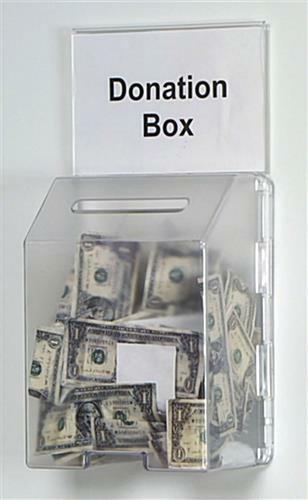 The sign frame on these donation containers can be changed out without having to remove the units from the wall or empty the contents. Simply slide the old sign out one side and replace with a new image from the opposite side. 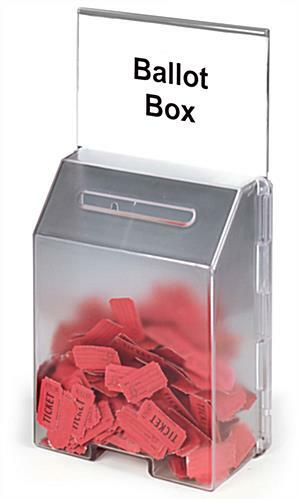 These ballot boxes are just one of several variations offered in this online warehouse. 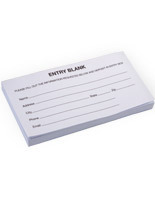 For the complete selection of similar products click back to the main catalog pages. Buy these ballot boxes before 1pm EST to qualify for same day shipping options. 8.3" x 16.0" x 4.8"